Can anyone suggest a simple method to do that? 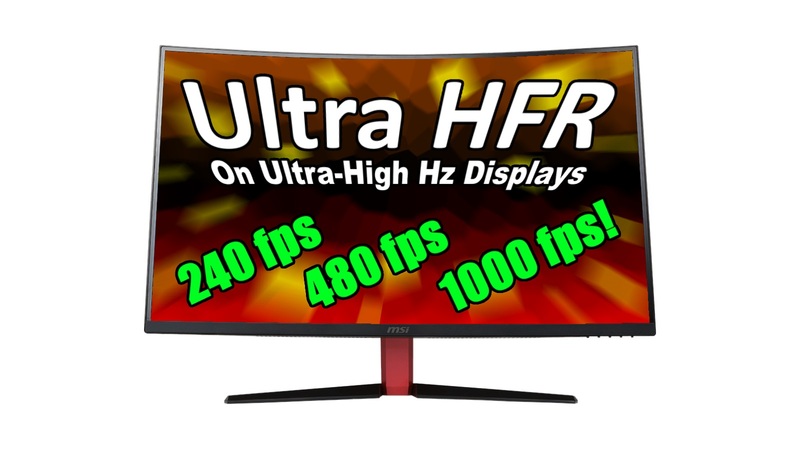 Re: How to make a 480 Hz video!? I'm not aware of any capture tools that can capture at 480FPS. In fact, 60FPS seems to be their limit. To produce a 480FPS video, you'd need to capture 60FPS footage from a game that has a configurable time speed. Source engine games have knobs for this. CS:GO for example. You can configure it to run 8 times slower. You can then capture at 60FPS, and then convert the video to 480FPS which means it plays 8 times faster, which will get you normal speed. Actually I was thinking about something like, a video made by sequentially playing 8 (or 8xN) selected pictures in loop at 480 Hz. I can help if you want to try some UltraHFR experiments! Very easy to do, just one command after recording a slomo video. RealNC suggestion works great, but not if you want to play in realtime, which makes things much more complicated! I'll need to make a longer post about UltraHFR experimenting with game recording. It requires custom settings and essentially recording screenshots of every frame to an SSD RAID 0. 240 amd 480 screenshots per second is achievable. Then merging this all into a video. Be ready with an SSD RAID 0 though. A single Samsung 960 Pro may work fine. You need something that will not slow down the game when you firehose all those screenshot bitmaps to disk. This is what was done for our 120fps gameplay video. This was the world's first!! Works for 240fps and 480fps too. Standard workflows (used for 60fps) are not possible so you need a custom workflow. .mp4 files supports UltraHFR frame rates. If I only need to loop 8 pictures over and over at 480 Hz (without interruption/drop-frame between each loop), is there any other method to do it (I want to avoid ffmpeg's massive output file size)? I have tried looping 4 at www.testufo.com/scanout ....it flickers epileptic at 60Hz but looks like a blended static image at 240Hz. Lopping only 8 frames at 480fps will make it look 8 superimposed frames (12.5% alphablend). They loop so fast you can't see the motion, as it's repeating the same frame 60 times a second. It looks similar to merging 8 frames of 12.5% transparency into one static frame. So basically it just looks like a static image if frames are repeatin at your flicker fusion threshold. So it looks alpha blended. Yes, it's because I want to have it blended as a static image! I am working on a project with fast-switching lens synchronized with the display to create a depth image at 60 Hz (therefore, 8 depth). We've demonstrated this with 144 and 240 hz display, but it'd be fun to do it on a 480 hz display! Anyway, any decent video editor should allow you to use images as individual frames that you then just copy&paste a lot to duplicate the same 8 frames of the video. You should be able to set the frame rate to 480FPS. Since it's only 8 frames, I doubt you'll get huge file sizes? The video codec should detect that it's the same frames. So just try that approach and see if it works. I am testing ffmpeg now and quickly ran into the problem of playback. where it loads "1.png" through "8.png" and makes a 240 hz video loop until 10 s limit reached. MPC-HC can play the video about 400 fps tops and it is flicking from time to time (I am using GTX 970). I've also tried VLC and windows media player and tweaking the settings, but it seems they are even slower. Originally I was thinking about something like the UFO test animation. My PC can view the animation in Firefox at 480 Hz. Is there an article on how the UFO test animations were made? One note, rapid image rotating interacts with 6-bit FRC so you will get some colordepth reduction artifacts, as well as inversion artifacts.